Take the whell of this amazing car in the new car game. 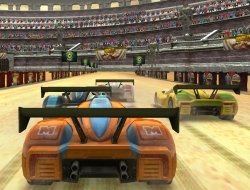 This is also a 3D game so you will get a nice thrill whilst driving very fast in tight bends. This is a miniclip sponsored car and you can be assured that is at least as good or better than your opponents. It all comes down to how well you can drive, given that the tracks are quite challenging for a newbie driver, and the roads are full of sand. Drift through the corners to keep your speed up and when you see a straight line on the map ahead of you, activate your nitro boost to gain the edge in each race. Be the first to complete the required number of laps on the track and you will be the winner. Play this racing game in full screen mode if you want to really get into the life of a professional driver. Use the arrow keys to drive, and double tap the acceleration for the boost of speed. Gas & Sand 8.40 between 0 and 10 based on 5 votes.